Our current work revolves around the lofty goal of changing how biology is treated medically, spiritually and every other way. It involves the work of many brilliant scientists and alchemists from our past and present... I have outlined three things that I believe to be at the core of medicine's future as we leave pharma behind, and really begin to understand ourselves. We are Beings of Resonance, made of water...electrical in nature... for your consideration. 1. We have a direct and very interesting connection to our Earth. The match between our active brainwave or "Alpha" wave, and the Schumann Resonance, or Earth's pulse, is food for MUCH thought. They were the exact same frequency when measured by Dr. Schumann in 1951. We believe there are many other yet to be discovered connections to her, Gaia. We know this much, when we cannot feel her pulse, bad things happen. It seems Fibromyalgia is related to this connection. Our work and living environments have us swimming in 900mhz networks. All one has to do is look at the cell phone's list of available networks to know just how ugly it is out there. If the radiation levels of these networks are not what is giving us our chronic problems, their proliferation and overlapping nature make it hard to assimilate with Earth's pulse, and we believe that is a profound problem. Having that separation from Earth harms us. The Schumann Resonance, measured in at 7.83hz in 1951 but has risen to and hovers in the area of 8.3hz today, and often higher. There are sites online that publish the pulse daily. Our connection to Earth needs be recognized and utilized in our healthcare and lifestyle. 2. We are made of salty water, 70%, plus or minus....so we then become conductors/conduits of electricity. Between the smart meters and the wi-fi networks, it is like walking around with your finger in the socket. We believe, Japanese scientist Dr. Masaru Emoto (and now many others) have shown us without a doubt that water has some degree of Consciousness or even greater, a possible conduit to Source. What we "feel" is directly related to our water molecule. Simply requires a quick search online for "Emoto and water," many videos to learn from. The info is exceedingly life changing and must be considered in our healthcare and lifestyle choices. In a nutshell he has shown us that water is our Perceiver. We believe when you glow from being loved, recognized and appreciated, your brain is not giving permission to the rest of you to feel good. It is of the heart, not the brain. It is the heart that rules feelings or the emotions born of them. What is really interesting is we seem to share our responses. We glow from love and sink from abuse, all of us. Is this the spiritual meaning of being connected? We are all made of Earth's water. We all seem to expereince love, hate, neglect the same way, which leads us to the simpe yet life changing theory, "if it is of your heart, it is of your water." The interesting part in all of this is, we all feel love the same way, so it unifies us all. So, did Dr. Emoto show us how Source speaks through us? Is our emotional content a direct connection to Source? Is this connection the answer to placebo? If we are even close, it suggests the pineal gland is your direct connection to your water's Wisdom. Possibly Source itself? It validates all that is said about meditation making a difference and group meditation changing the world. It is like a collective (free)will message to Source. This has to be explored as well as what we call the Etheric. We believe all biology will benefit from a greater understanding of these principles. 3. We are electrical in nature. 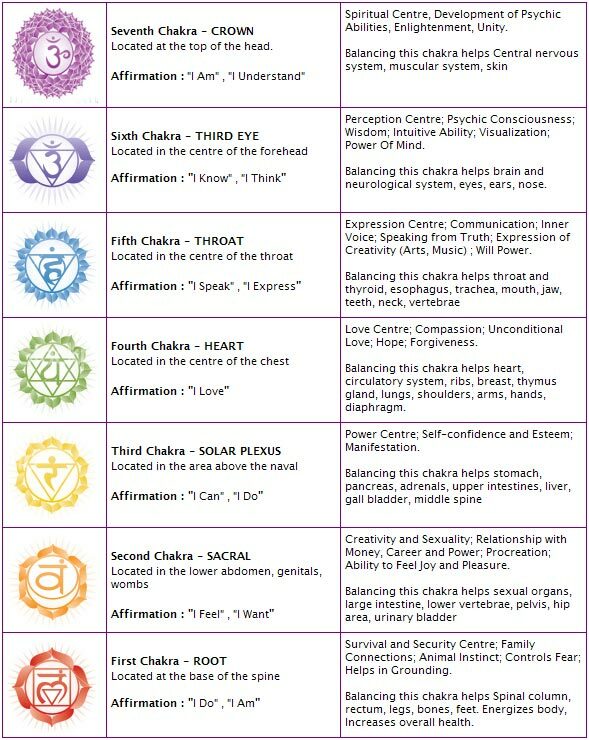 (The Chakra chart below is an ancient breakdown of our electrical selves.) Western medicine knows this hence the "magic paddles" employed when your heart stops. What they fail to see is our electrical systems need to be serviced and maintained. It is like taking your car to a mechanic that does not know you have spark plugs. Our research is showing us that some of what pharma fails to fix, is electrical in nature. If you see pharma as a gas treatment you will understand no amount of gas treatments will fix a bad spark plug wire. You have to treat an electrical problem with an electrical solution. Twitches, spasms, even obsessive compulsion disorder....it is like a skipping record. We remedy almost every twitch and Parkinson's-like shake we encounter simply by having the person hold a BioRox2. Results will vary, we do not relieve them all, there are many individual factors and diagnosis, but a significant amount of people suffering from a shake of some kind, born of a host of different reasons from lightning strikes to MS, can be significantly relieved in seconds. We are still learning. We are experiencing tremendous success with many things pharma fails with. We make no promises, but have seen it enough to know we are onto something significant and it effects all of us. We believe a greater understanding of the spark that drives biology will lead us to much longer and healthier lives. We also believe the work of Masaru Emoto to be significant in understanding our full capacity to heal ourselves, and increase the quality of our daily living. Utilizing colors and crystals to achieve subtle variations in frequency, our beautiful BioRox and BioRox2 sculptures give gentle boosts to the correlating Chakras. Additional crystals like Amethyst are added to amplify the effects or boost an additional chakra.